While it might seem a little repetitive, The Warlord – Travis Morgan, faces his arch-nemesis Deimos once again to rescue his daughter Jennifer. Before that happens though, Deimos is in a bit of a state, being comprised of only a head and a hand and so travels back in time to ask a boon of the Evil One, to restore his body and his life so that he might destroy Morgan once and for all. The Evil One agrees, but in return takes away Deimos’ magical abilities. What follows is a great confrontation between our hero and Deimos with an ending that is brutal to say the least. Mike Grell crafts a wonderfully exciting tale that sees what must look like an end to the rivalry between these two characters, though knowing Grell and knowing Deimos, the man is sure to live to fight another day. Grell’s artwork is still spectacular and looks better than it ever has before. He has a great sense of action and pacing in the book and the battles which are staged throughout the book are done so with expert execution. We get to see a bit of Mariah and Machiste this issue which was nice, the bad thing about it being them still stuck in the past with the wizards who remain completely unfunny no matter what Grell does with them. Seeing Morgan this issue turn from a fairly happy-go-lucky guy into one with a harder edge by the end of the issue was good in one way as it advanced his character some, which does not happen very often, but also bad in a way because Morgan will never really be the same after what he let happen. The actions perpetrated by the man might lead to some interesting storylines though so it might be worth it in the long run, but only time will tell. 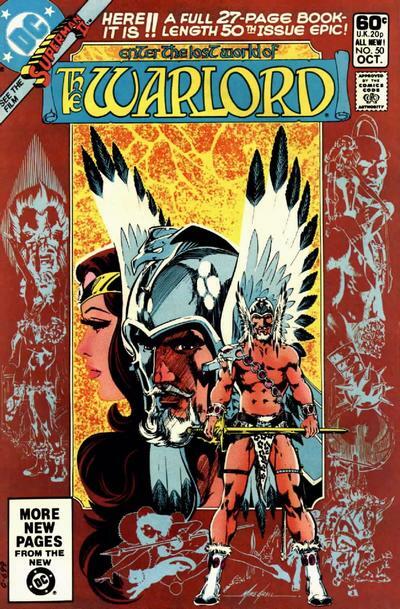 All in all, this was a very solid issue of The Warlord, double the length and no filler or backups either, a really great book in Travis Morgan’s ongoing adventures.